However, a stand that looks thin in the spring does not always correspond to lower grain yield. 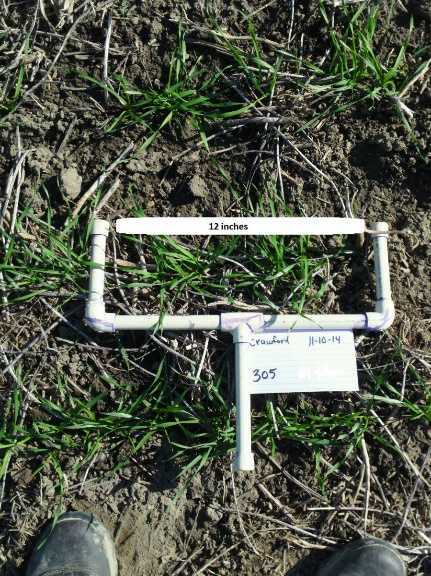 Rather than relying on a visual stand assessment, farmers should estimate the yield potential of their winter wheat crop by counting stems, before deciding whether a field should be destroyed. An alternative method to evaluate wheat stand is fractional green canopy cover (FGCC). 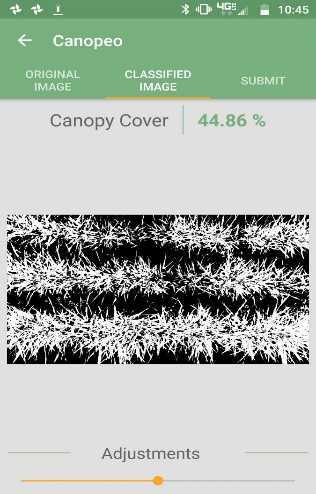 Fractional green canopy cover can be used to measure the canopy surface area using the mobile device application Canopeo. The app can be downloaded for free here: http://www.canopeoapp.com. Wheat Stem Count Methods: Wheat stems (main stem plus tillers) should be counted at Feekes 5 growth stage (leaf sheaths strongly erect) from one linear foot of row from several areas within a field (Figure 1). Figure 1. Measurement tool used to consistently count the number of stems in one foot of row. Fractional Green Canopy Cover Methods: Fractional green canopy cover should be measured at Feekes 5 growth stage using the mobile device application, Canopeo (http://www.canopeoapp.com). The camera should be held at a height to capture three rows of wheat in the image (Figure 2). Figure 2. Winter malting barley image analyzed for fractional green canopy cover with the Canopeo mobile device application. After counting the number of wheat stems or measuring FGCC, Table 1 can be used to estimate wheat grain yield. For example, if an average of 51 stems is counted from one foot length of row, the predicted grain yield would be 100 bu/acre. Similarly, if the average FGCC measurement was 35%, the predicted grain yield would be 100 bu/acre. Table 1. Estimated grain yield based on number of stems and fractional green canopy cover (FGCC).